Indian rupee turns lower against the dollar in afternoon trade, on focusing the Federal Reserve chairman’s upbeat comments on the U.S. economy and his views that the authority was on track of gradual rate increases boosted greenback demand, outweighing early gains from lower crude oil prices. The rupee was last seen at 68.58 to a dollar, against 68.45 at previous close. It opened slightly higher at 68.42 and extended gains to 68.38, before falling to the day’s low of 68.59. Most Asian currencies were also trading lower against the greenback. The market turns negetive in afternoon session after Sensex hitting the fresh highs, selling in metal stocks, pharma sector ,PSU banks and midcaps are responsible for bearish bias. The Sensex is down 35.44 points or 0.10% at 36484.52, while the Nifty fells 4.30 points or 0.04% at 11003.75. The market breadth is negative as 882 shares have advanced, 1,326 shares declined, while 136 shares were unchanged. Asian markets finished lower today. The Hong Kong's Hang Seng closed down 0.23% and the Shanghai Composite ended the session lower by 0.35%. European markets are higher today with shares in Germany leading the region. The DAX is up 0.77% while France's CAC 40 is up 0.59% and London's FTSE 100 is up 0.48%. 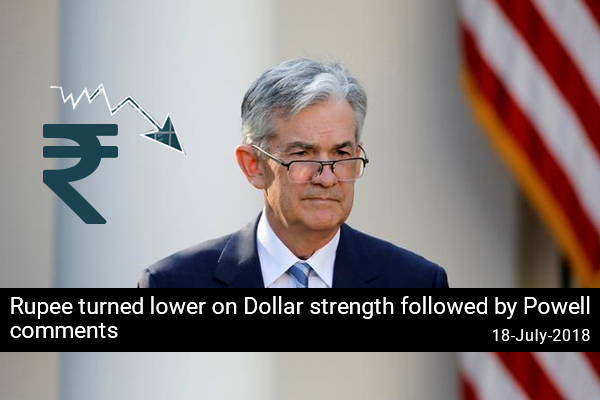 The dollar index was trading 0.2% higher, extending overnight gains of nearly half-a-percent and closing at an over two-week high yesterday, after Powell in his testimony provided a positive assessment of the U.S. economy and indicated that the central bank will maintain the course over interest rate increases. The Chinese onshore yuan fell to a two-week low and was last trading down 0.1% at 6.71 against the dollar. Brent crude oil price was trading below the $72-per-barrel mark, the lowest since mid-April, on unexpected rise in U.S. crude inventories last week. It closed at $72.16 in the previous session.